In my main album for the last couple of days I have been posting photos of the shacks at Tin City and also explained how we trekked over the dunes to get there. Here you can see one of our group of trekkers, not really in need of water, but just one of our photographers taking a photo of sand. ha ha. Off in the distance you can see another of our group. We were lagging behind somewhat at this point. If anyone is interested here is the link to the first of my photos of the shacks at Tin City and also the narrative explains how we got there. Big sand dunes... nice shot.. Fantastic image making us wonder what she is doing there. Sounds like a fun time!! ha ha, water, water I get it! Wow those dunes look Big! Would have been a great day for you all. Ha ha ! love this ! I thought she was crawling because she was on her last leg! Great capture! An image which could be the beginning of a great story. Fav. Great capture and really believable! Great composition. I think I would not be acting at this point. I would definitely be on my last leg, and needing water. Your title is perfect. Glad this shot made you smile. It took two bottles of water to do this trek and it was very hard going on the legs. 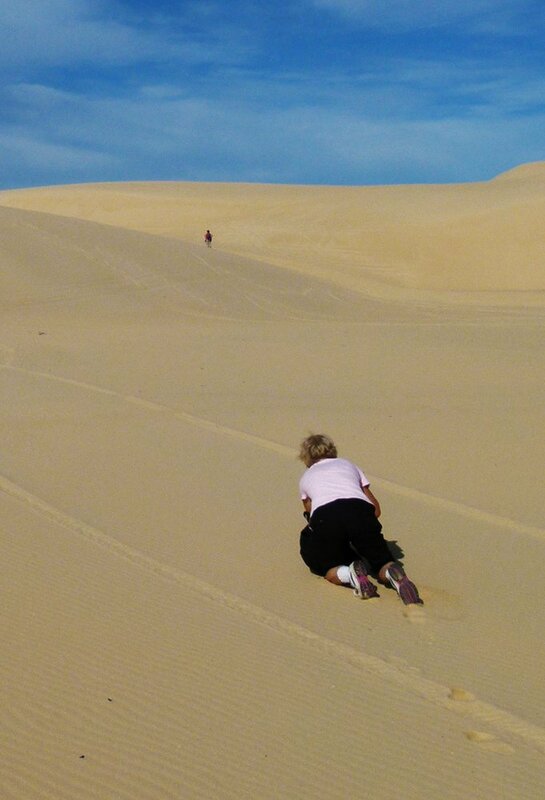 That is so impressive that you hiked over the dunes to get to Tin City! And this shot really shows how easy it might be to lose your sense of direction there! Great shot and view. I saw once a Japanese movie : A woman in the dunes. A story of a man lost in the dunes . Saved by a woman that lives in a village no one could excape from. @annied no chance of sending for the NRMA either to lift you up again. @olivetreeann Yes we did hike there and I am not doing it again. ha ha. It would be so easy to get lost that is why we put down markers at intervals. Once we could see the ocean it was easy to find Tin City but finding our way back to the Boyces trail in the national park would have been impossible without having the markers there. Goodness me Babs, it looks like a very long walk to be completed! Thats exactly the position I would be in. Fabulous capture. Tells a story. It was only about one and a half km through the Worimi national park track and another 1 km over the dunes, but the dunes trek was the killer as you can see. Going down was okay though. @kjarn ha ha, me too on the way back. @onewing Always tough on the legs going back down! @gigiflower Easier to roll down some of the dunes I suppose if they are huge, but you do get a lot of sand in your knickers. @onewing HAHA! Now that's my worst nightmare. I really don't like sand anywhere! @onewing Thanks for the link. Have seen the movie already twice but I`ve store the link. Thanks. I was about to call for medical assistance!